Beautifully hand-forged pliers, perhaps thirty years old. A spice vendor uses these pliers to crush samples of spice to release the spice’s fragrance for customers to smell. Alappuzha. Beautiful hand-forged pliers, edge view. Alappuzha. This locally-made axe head was for sale on a market street in Alappuzha. 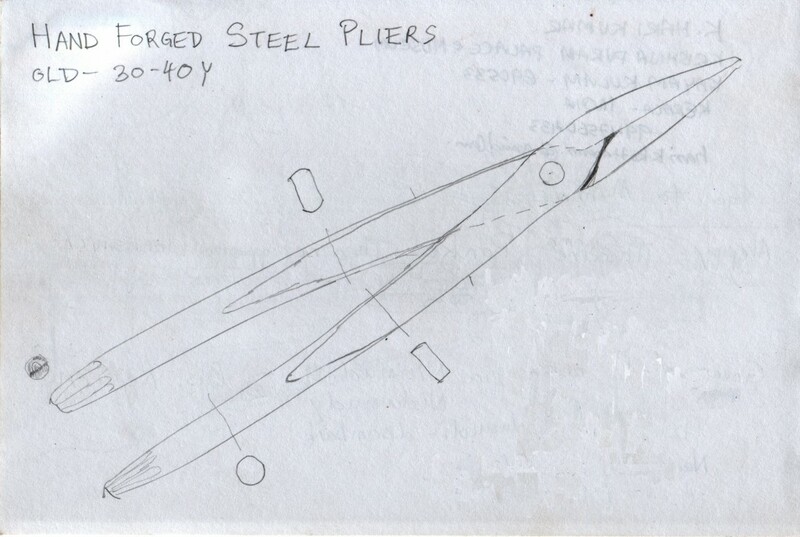 The manufacturer welds a U-shaped piece of steel onto a wedge to make the eye for the handle. 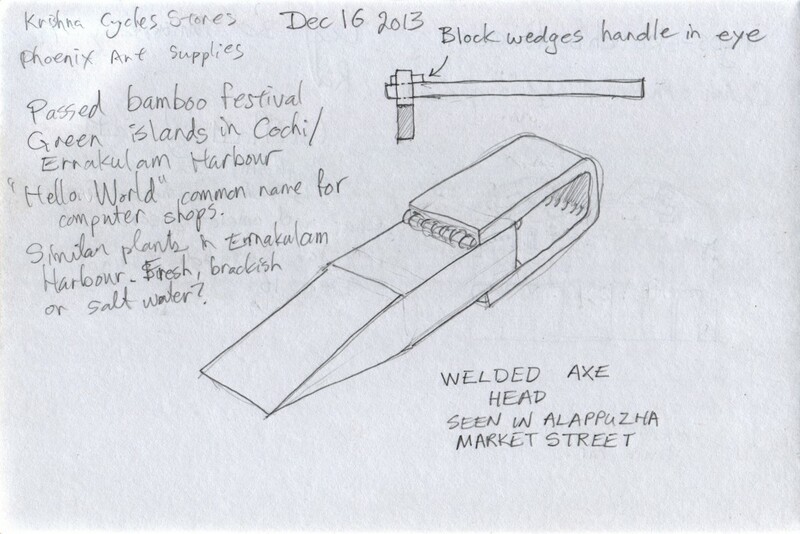 Elsewhere I saw axe heads forged from a single piece of steel. A vendor on one of the market streets in Alappuzha stocked these small-bowl hand-forged spoons. 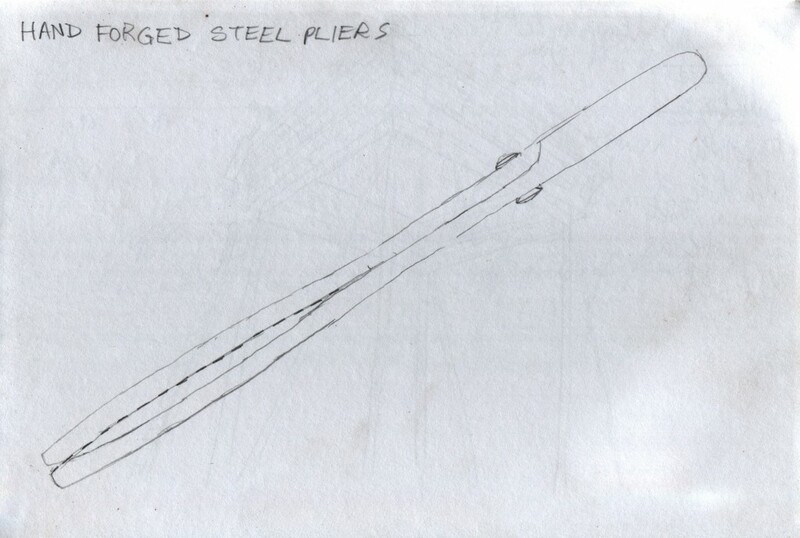 They appear to be forged from about 1/4″ round steel stock. I asked around, but did not find out their intended purpose. This hand-forged knife was among the wares for sale at a hardware store in Irinjalakuda. Though I admired its craftsmanship, I did not buy the knife. Each knife’s shape is like a word that describes its function, and I find the connection inseparable. This is the shape for a hunting knife, and I don’t hunt. This hand-forged pair of shears is in steady use at a hardware store. The store sells new, factory-made shears, but uses these older style shears. The staff praised the quality of the old shears. The blade cheeks have a fine, subtle hollow ground into the shearing surface. The steel surface is black oxide, which feels good in the hand. Thank you to Nila Traders for allowing me to trace these shears. This pair of shears is also hand-forged. It is possible to see on the handles where the smith formed round grips out of the flat stock. These hand-forged shears are also in service at a hardware store. As do the others, they have a black oxide coating.